New octogenarian senior citizen, environmentalist, actor, producer, director, businessman and philanthropist Charles Robert Redford Jr. was born on August 18, 1936 in Santa Monica, California. In Robert Redford: The Biography (2011) by Michael Feeney Callan, Redfords recounts his parents marrying shortly after his birth, his childhood in Los Angeles and the ending of World War II. Redford graduated from Van Nuys High School in 1954; his focus had never been on school work, more on sports, girls, hotrodding, and hijinks that included drinking. He has said he spoke to 15-year-old actress Natalie Wood when he (a senior) refused her admittance to a Van Nuys High School assembly, but she wouldn't likely have remembered it; Wood was already a movie star. 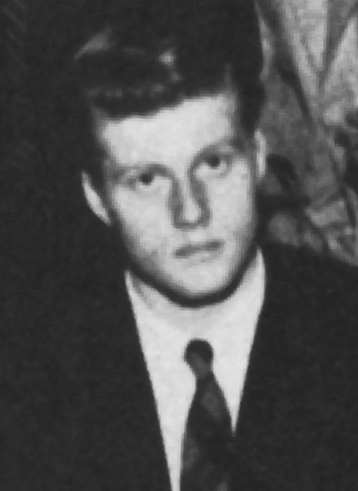 Robert Redford enrolled at the University of Colorado (UC), where he had hopes of a baseball scholarship. While attending UC and driving home, Redford was impressed by the beauty of the Timp Haven canyon and Mount Timpanagos near Provo Utah. Redford's mother's death in 1955 devastated him and heavy drinking soon curtailed his university career when he lost his scholarship and was kicked out. At loose ends, Robert Redford went to Europe in the late spring of 1956 to study art and travel; he suffered a mini-breakdown. On his return to the U.S. in March 1957 he travelled across the U.S. and met Mormon college student and Provo, Utah native Lola Van Wagenen. They fell in love, but Lola continued her college studies while Redford moved to New York to study drama at New York's American Academy of Dramatic Arts (AADA) in October 1957. In early 1958, a lonesome Robert Redford asked Lola to elope and move to New York with him. She dropped out of college and on August 9 1958, Lola Van Wagenen and Robert Redford were married in a private ceremony in a Las Vegas walk-in chapel. They had a Mormon marriage ceremony in front of her family in Provo, Utah on September 12, 1958. Robert Redford continued his studies at AADA, and won a scholarship while Lola worked. He began to gather attention from casting directors and appeared in a small role for 3 months on Broadway in the basketball comedy Tall Story (1959). Lola and Robert Redford's first child, son Scott Anthony Redford was born in later that year in September 1959 and died a couple of months later in November from SIDS (Sudden Infant Death Syndrome). Lola and Robert Redford soon had more children - daughter Shauna Redford (b. Nov. 1960) and son James Redford (b. May 1962). 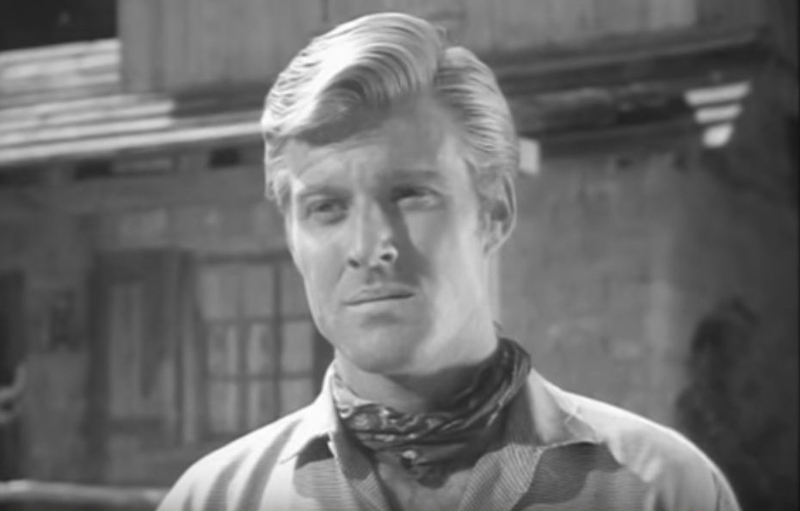 From 1960-1964 Robert Redford appeared in TV movies and episodes of popular baby boomer television series such as Maverick, Perry Mason, Route 66, Naked City, The Virginian starring James Drury, The Untouchables, Bus Stop starring Richard Anderson, The Twilight Zone, and Dr. Kildare starring Richard Chamberlain. In the TV movie Captain Brassbound's Conversion (1960) starring Christopher Plummer and Greer Garson, Redford was simply "Blue Jacket". He earned an Emmy Award Best Supporting Actor nomination for his performance in an episode of the television series Alcoa Premiere titled The Voice of Charlie Pont (1962), starring Fred Astaire, Bill Bixby, and Bradford Dillman. The movie version of Tall Story (1960) starring Anthony Perkins, Ray Walston, and Jane Fonda in her movie debut, was also Robert Redford's first movie role - as an uncredited basketball player. He had a bigger role in the Korean War drama War Hunt (1962), which starred John Saxon, Sydney Pollack, Gavin MacLeod, and Tom Skerritt. A lifelong friendship between Sydney Pollack and Robert Redford, and Redford and Tom Skerritt, was born. Leading roles on Broadway in the romantic comedies Sunday in New York (1961-1962) and Barefoot in the Park (1963) followed. Redford told Men's Journal he bought 2 acres of land in Timp Haven canyon, Utah for $500 in 1961 and built a cabin there to retreat to with his young family. "My wife and I would snowshoe up in the winter, with our kids on our backs." Robert Redford's first credited big-screen movie was the comedy Situation Hopeless...But Not Serious (1965), in which he co-starred with Alec Guinness and Mike Connors (Mannix). In December of that same year, the drama Inside Daisy Clover (1965) starring Christopher Plummer, Natalie Wood, Robert Redford, Roddy McDowall, and Ruth Gordon was released. 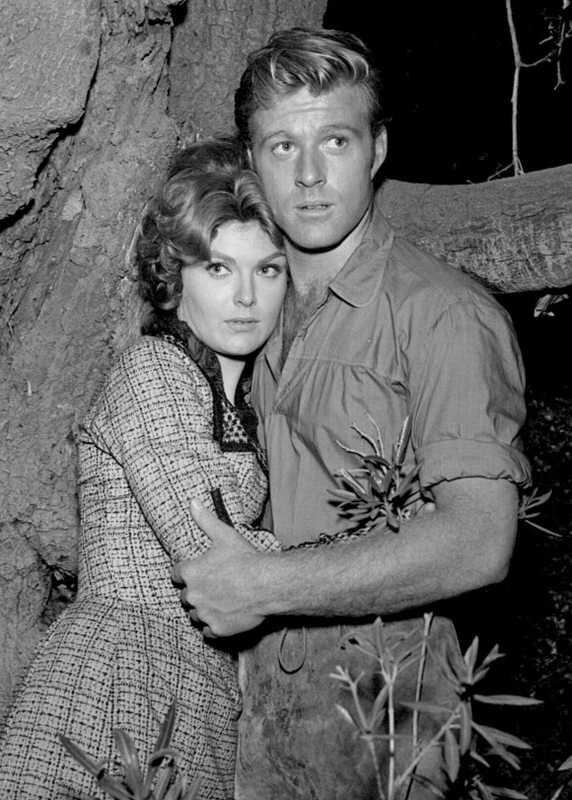 Redford won the 1966 Golden Globe Award for New Star of the Year - Actor for his performance as a bisexual Wade Lewis, who marries and then abandons Daisy Clover (Natalie Wood). Redford has said that Natalie Wood chose him to be her leading man in both Inside Daisy Clover and This Property is Condemned; they became friends, and he was best man at her second wedding. The prison-break movie The Chase (1966) was released in February 1966. Marlon Brando starred as Sheriff Calder, with Angie Dickinson as his wife Ruby Calder. Robert Redford was escaped prisoner Charlie "Bubber" Reeves, and Jane Fonda was Bubber's lonely wife Anna Reeve. Others in the cast of The Chase included Robert Duvall, Diana Hyland in her second movie with Robert Redford, and Jocelyn Brando (Marlon Brando's older sister). The Chase was the first of three movies that Robert Redford and Jane Fonda would co-star in. Natalie Wood, Robert Redford, Mary Badham (Scout in To Kill a Mockingbird), Charles Bronson, Kate Reidare featured in the This Property is Condemned (1966) movie trailer, above. This Property is Condemned was the second pairing for Robert Redford and Natalie Wood. Robert Blake and Dabney Coleman also appeared in This Property is Condemned, which was the first of 7 movies starring Robert Redford that were directed by Sydney Pollack. The Neil Simon comedy Barefoot in the Park (1967) starred Jane Fonda and Robert Redford as newlyweds. Both Redford and Fonda had played their respective roles in the 1963 Broadway production of Barefoot in the Park, as had Mildred Natwick (Fonda's on-screen mother). Veteran actor Charles Boyer co-starred as the odd neighbour, and character actor Herb Edelman was the telephone installation guy. The western Butch Cassidy and the Sundance Kid (1969) co-starred Paul Newman as the outlaw Butch Cassidy and his pal Harry Longabaugh "The Sundance Kid", played by Robert Redford, of the infamous Hole in the Wall Gang. Katharine Ross co-starred as The Sundance Kid's lover. Cloris Leachman and Sam Elliott also had small roles in the movie, with Elliott making his movie debut. Jack Lemmon passed on the role of The Sundance Kid because he didn't like riding horses; after Warren Beatty also passed and Steve McQueen agreed and then dropped out, Robert Redford became The Sundance Kid. Butch Cassidy and the Sundance Kid was released on October 24, 1969 and became the top-grossing movie of that year; it has remained a favorite with seniors, baby boomers, and younger generations. Paul Newman and Robert Redford became lifelong friends. 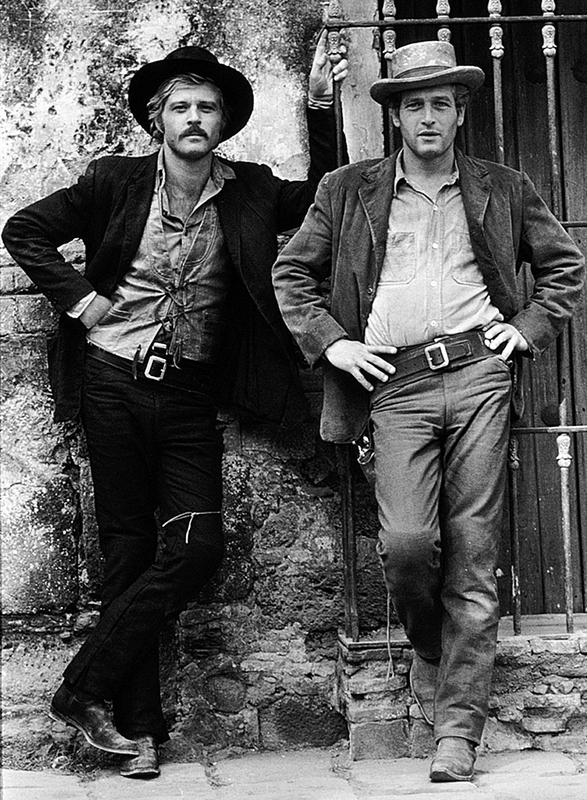 Screenplay writer William Goldman, who had researched Butch Cassidy and the Sundance Kid for 8 years, would work several more times with Robert Redford. Next, the sports drama Downhill Racer (1969) saw Robert Redford (U.S. Ski Team hopeful) co-star with Gene Hackman (team coach). Dabney Coleman (assistant coach Mayo) and Sylvester Stallone in an uncredited role, also appear in Downhill Racer. Redford learned to ski for the movie, which was filmed on location in Europe (Austria, Switzerland, and France) and in the United States (Colorado). Robert Redford was also an Executive Producer for Downhill Racer via his new production company, Wildwood Enterprises. Although not a box office success, Downhill Racer was critically acclaimed and Redford was nominated for the New York Film Critics Circle Awards Best Actor for his performance. In a fictionalized retelling of a true story, Tell Them Willie Boy is Here (1969), Robert Blake starred as the Native American Indian Willie Boy, who is on the run, bringing along his girlfriend (Katharine Ross). This was the second Robert Redford movie for both Robert Blake (This Property is Condemned) and Katharine Ross (Butch Cassidy and the Sundance Kid). Redford played Deputy Sheriff Cooper who goes in pursuit of Willie Boy with a posse, and Susan Clark was Dr. Elizabeth Arnold. With his salary from these movies, Robert Redford purchased the Timp Haven ski slope in 1969 near his Utah cabin and changed the name to Sundance; thus began an entertainment business empire. Lola and Robert Redford's youngest daughter Amy Redford was born in October 1970, the same month his motorcycle racing comedy Little Fauss and Big Halsy (1970) was released. Despite able co-stars Michael J. Pollard and Lauren Hutton, and with Johnny Cash, Carl Perkins and Bob Dylan contributing on the soundtrack and title song, Little Fauss and Big Halsy is forgettable at best. Will Geer and Robert Redford are featured in the above clip from Robert Redford's next film, the western box office success Jeremiah Johnson (1972). Jeremiah Johnson was filmed on location in Utah beginning in January 1971, with some scenes shot at Mount Timpanogos near Redford's home. Sydney Pollack directed Jeremiah Johnson after Redford talked him into it. Robert Redford's other two movies released in 1972 included the crime caper The Hot Rock (1972) co-starring George Segal and Ron Leibman, with Charlotte Rae as Ma Murch. Although based on a novel by Donal E. Westlake, the screenplay for The Hot Rock was written by William Goldman (Butch Cassidy and the Sundance Kid). The Hot Rock received some critical acclaim, but it cost more to make than it made at the box office. Faring better with the critics was the political satire The Candidate (1972) starring Robert Redford, as featured in the movie trailer above. Robert Redford starred in and also executive produced The Candidate via Wildwood Enterprises (although he was uncredited as such). Redford's friend and previous co-star Natalie Wood came out of semi-retirement to film a cameo in The Candidate as herself. Two blockbuster movies released in late 1973 made Robert Redford a top box draw with baby boomer audiences again. Director Sydney Pollack directed his third movie starring Robert Redford in the romantic drama The Way We Were (1973), released in October of that year. Screenwriter Arthur Laurents had originally written the movie with Ryan O'Neal in mind for the secondary role of Hubbell Gardiner, because O'Neal was having an affair star Barbra Streisand in real life. By the time The Way We Were approached filming, Ryan O'Neal and Streisand's affair had ended, so Robert Redford was cast as Hubbell Gardiner instead, and his role was expanded. Barbra Streisand sang The Way We Were title track, which became her first #1 hit single in the U.S. The Way We Were was the 5th highest-grossing film of 1973, making almost $50 million. This movie trailer for The Way We Were features Barbra Streisand, Robert Redford, and Bradford Dillman. Actress Sally Kirkland appeared in both The Way We Were and Redford's second movie in 1973, the depression-era crime caper The Sting. The Sting (1973) reunited Robert Redford and Paul Newman onscreen, and with their Butch Cassidy and the Sundance Kid director George Roy Hill. The Sting was released on Christmas Day in 1973 and became a huge box-office and critical success, bringing in almost $160 million and winning 7 Academy Awards including Best Picture. Robert Redford was nominated for an Academy Award for Best Actor for his performance in The Sting. Next year's The Great Gatsby (1974) was another box office success, although not on the same scale as The Way We Were or The Sting. Still, on a budget of $6.5 million, it made $26 million. Robert Redford starred as mysterious Jay Gatsby and Bruce Dern and Mia Farrow were the unhappily married rich couple Tom and Daisy Buchanan; Sam Waterston and Lois Chiles were also in the cast of The Great Gatsby. As happened with Butch Cassidy and the Sundance Kid, Redford got the leading role of Jay Gatsby after Warren Beatty and Steve McQueen turned it down. This movie clip from The Great Gatsby features Robert Redford and Sam Waterson.